Sciatica is pain running down the back of the leg. Sciatic pain usually results from one or more nerves in the lumbar spine being compressed or irritated. It usually runs through the buttock, and its distribution from there depends upon which nerve is being affected. The spinal canal and intervertebral foraminae in the lower back are bony tunnels through which the spinal nerves (nerve roots) run. When the size of these tunnels is reduced, pressure can occur. Symptoms of nerve or spinal cord compression include pain, aching, stiffness, numbness, tingling sensations, and weakness. As spinal nerves branch out to form the peripheral nerves, these symptoms may radiate into other parts of the body. For example, nerve root compression in the lower back can cause symptoms in the buttocks, legs, and feet. A disc prolapse (herniation) happens when an intervertebral disc is either ruptured or bulges. The intervertebral discs are soft structures which act as shock absorbers between each of the vertebrae (bones) in the spine. A single disc sits between each vertebra. 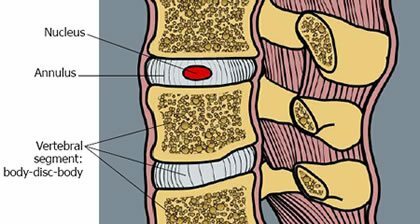 Each intervertebral disc has a strong outer ring of fibres (‘annulus’), and a soft, jelly-like centre (nucleus). The central soft and juicy nucleus is a spherical structure that allows tilting, rotating, and gliding movements in the spine. The nucleus also serves as the main shock absorber. It is a transparent, gelatinous substance that contains 88 percent water in young adults. With age and/or degeneration, the water content drops significantly. Collagen fibers, connective tissue cells, and a small amount of cartilage make up the remainder of the nucleus. The nucleus does not contain any blood vessels or nerves. The annulus is the toughest part of the disc, and connects each vertebral bone. The annulus is a ring-like mass of fibres which encloses the central nucleus and holds it under pressure to prevent rupture. In degenerative disc disease these discs between your vertebrae shrink and become worn out or damaged, which may lead to herniation. When a disc becomes ruptured, or herniated, the annulus is disrupted. The nucleus then partially extrudes from the disc. In other words, a lumbar disc prolapse (or herniation) occurs when the nucleus pulposis pops out of its usual position. Direct pressure on the nerves in the spinal canal or intervertebral foramen. Chemicals released from the ruptured disc irritate the nerves. Discs often rupture suddenly as a result of excessive pressure. Bending and heavy lifting are typical ways to rupture a disc. Intervertebral discs sometimes rupture with only a small amount of force. This is usually the result of weakened annular disc fibres which have become weak from repeated injuries over a number of years. This may also occur as part of the aging process of the spine. Degeneration and osteoarthritis can cause pain, numbness, tingling and weakness from pressure on the spinal nerves and/or spinal cord. This pressure may be a result of an osteophyte (‘bony spur’) formation, as well as hypertrophy (thickening) of the spinal ligaments and facet joints. 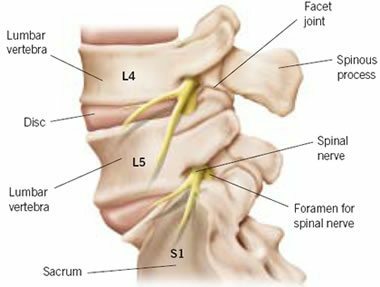 The spinal canal may be narrowed (lumbar canal stenosis), and the area just underneath the facet joints may also be reduced in size (subarticular or lateral recess stenosis). Osteophytes are abnormal bony spurs which form as part of the degenerative process or following a longstanding disc prolapse. This extra bone formation can cause spinal stenosis as well as intervertebral foraminal stenosis, both of which result in compression of the spinal cord and/or spinal nerves. When this occurs, it is known as foraminal stenosis. Sciatic pain as a result of spinal stenosis is frequently worse on standing and walking, and improves on sitting. This pain pattern is known as neurogenic claudication. Treatment for sciatica does not usually involve surgery. In fact, surgery is only necessary in a small percentage of patients. Your specialist may recommend that you make changes to your physical activities. This may include avoiding certain recreational and work-related activities. Special braces are occasionally prescribed to ease back pain. Short periods of bed rest may help with acute painful episodes, however strict bed rest is rarely needed. A well-rounded physical rehabilitation program assists in settling pain and inflammation, improving mobility and strength, and helping you to do your daily activities more easily. A combination of physiotherapy, hydrotherapy and clinical pilates is usually recommended. A review by a clinical psychologist is often useful. Strategies to manage pain may include cognitive behavioural therapy and mindfulness-based programs. It is important to treat any associated depression or anxiety, as these conditions may increase your experience of pain. Medications play an important role in controlling pain, easing muscle spasms, and helping to regain a normal sleep pattern. Long-term medication usage needs to be closely supervised so that problems such as tolerance and dependence (addiction) can be avoided. If the above measures fail, a nerve sheath injection can be organised in an attempt to reduce the pain. These injections may have diagnostic and therapeutic value, although the benefit is frequently short-lived (days to weeks). Surgery is needed only if other treatments options fail to keep your pain at a reasonable level, and if your underlying condition is suitable for surgery. Not all patients with severe unremitting back pain are suitable for surgery. Surgical treatment must address any mechanical (instability) and compressive (nerve pressure) issues. Surgery usually comprises a keyhole microdiscectomy.